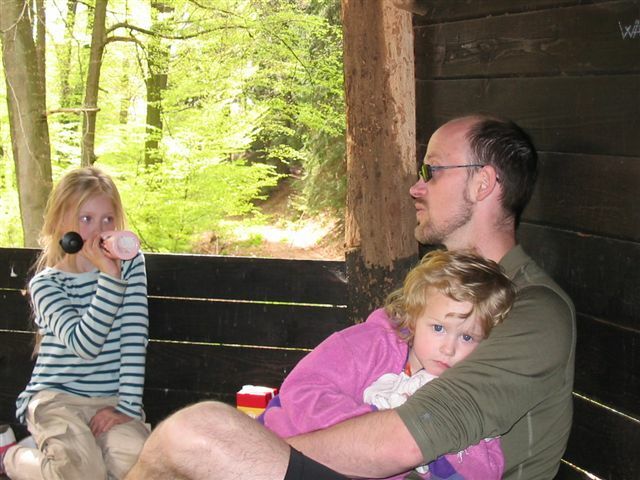 I have started out with backpacking slowly � single-day 24 km (15 mi) jaunts by myself or even shorter hikes in the company of my little daughter. I am getting started on longer hikes, as a lightweight packer and hammock-camper. I�ve begun upgrading my old gear and am now carrying a dry FSO weight (everything carried From the Skin Out except food, fuel and water) of a little less than 10 kg (22 lb) for three-season camping. Year of manufacture: 2007 ? 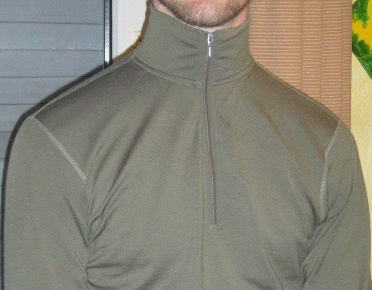 The SmartWool Next-to-Skin Zip T (henceforth Zip T) is a thin, tight-fitting, long-sleeved garment made of wool. As the name implies, it has a zipper at the throat, running down to my sternum. With the zipper all the way up, it has a turtleneck which ends right underneath my jaw. The material is stretchy and soft. The Zip T fits snugly. The wrapper it came in says that it is cut somewhat longer to allow for some shrinking upon first washing. I've pulled it on right out of its package regardless, and left it on for two days (though without heavy exertion). I washed it thereafter (machine wash on low temperatures, which with my German washing machine means 40 C / 105 F in a front-loading washing machine with a 1600 rpm spinning cycle) and let it air dry (the instructions allow machine drying, only we don't have a dryer). I may borrow a neighbour's dryer for testing purposes at some time during the test. It does appear to fit a little more snugly now, though this is not a significant change. The sleeves are still on the long side, for which I'm happy. In fact, if the sleeves were 2 or 3 cm (an inch) shorter, they would still fit. This is the first time I've seen that in any garment (much less size "M", which the manufacturer's sizing table suggested I take) and I'm happy. With the zipper all the way, up, I'm wearing a turtleneck top which comes up to just below my jaw. I do not find its top or the zipper scratchy underneath my jaw, nor do I foresee any issues with my beard. It fits just right in this regard. With the zipper halfway down, it forms a very small collar, which looks a trifle odd - maybe that's a fashion thing, and people will love it next seasons. I don't know. Or care, really. With the zipper all the way down, it looks more like a normal collar. Only I'm showing a lot of chest. 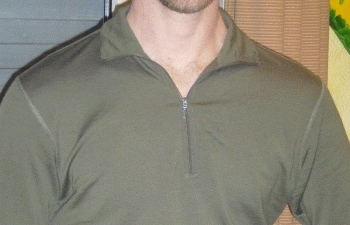 My wife observed that yes, with the zipper down the collar looks normal, but I look a lot less clothed. All right! Should be good for ventilation. I'm happy. It was a bit scratchy at first. Really, just a little bit. Not the sort of scratchy thing the standard type of wool pullover gives me when worn directly on skin (which I don't like, and therefore usually don't do). More of the type of slightly scratchy feel new clothing has before it's been washed. And indeed, that feeling went away after washing (with a small amount of standard no-name detergent). I have since worn it for several days without large interruptions (I've cleaned myself in the meantime, but not the shirt, and put it on again afterwards). It doesn't smell fresh anymore of course, but neither does it stink. I've come to expect that of cool new wool clothing, and the Zip T delivered. I've found that it is easy to slide the sleeves up my arms to the elbow or so. The sleeves are stretchy enough to stay there of their own accord, but without restricting blood flow to my lower arms. Another thing that makes me smile. I've worn this shirt a *lot*. I've worn it for up to four days of low to medium exertion at a stretch, including the nights. 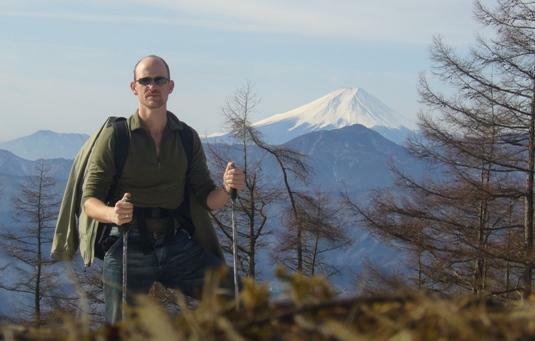 I've worn it on a spontaneous overnight hike of the Tokyo prefecture's highest mountain (Kumotori-san), backpacking and (mostly) dayhiking trips, running, cycling and an outside Martial Arts class (knife defense). It's been worn underneath a hardshell or an insulation jacket or both, as well as an only layer, as conditions warranted. It's seen rain, snow, wind and sunshine and my washing machine (though not so often). Temperatures were from -7 to 25 C (20 to 75 F). It's been worn carrying weights from nothing over a light daypack and an overnight excursion pack to an occupied child carrier of 18 kg (40 lb). For most of the Field Report phase, warmth was an issue of being warm enough. With temperatures below, around or just above freezing, the Zip T was a welcome base layer underneath whatever I happened to put on over it, whether for backpacking purposes or other uses. It hugged the skin for a bit of warmth that a simple T-shirt, at nearly equivalent weight, would not provide. With the zipper and collar down, I could wear it underneath office apparel, and I was still able to zip up the collar when outside and wearing a hooded jacket for that bit of additional warmth around the neck. This was very welcome. 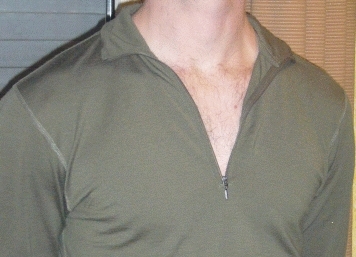 I have found it easy to regulate my core temperature when wearing the Zip T during heavy exertion. When it was really cold outside (for me, meaning that puddles froze over), I'd just wear a jacket (often hardshell) over it and use whatever ventilating options that shell provided. The Zip T, zipped up to underneath my chin, simply stayed in place and provided the baselayer which prevented the ventilation from becoming chilling. This was particularly pronounced on my hike of Kumotori-san, which started at four in the afternoon, at 300 m (1000 ft) of elevation in temperatures of about 15 C (60 F) and ended at midnight at 2018 m (6621 ft) of elevation and -7 C (20 F) temperature. I was only wearing the Zip T in the beginning, even partially zipped down on the steeper initial sections. After the zipper went up, the hardshell quickly followed, though I left it open at first. Wind *and* cold are a combination against which the Zip T doesn't help so much. For the remainder of the ascent, I adjusted front and pit zips on the hardshell jacket but simply left the Zip T on and never felt the need to resort to an additional insulation layer. This included (albeit short) rest stops in below freezing temperatures. With less exertion (like strolling around Tokyo with my backpack on) in temperatures not much above freezing up to about 10 C (50 F), I was usually wearing an insulation layer between the Zip T and my hardshell jacket as well. The Zip T never felt stifling in this setup and I felt that I could always adequately regulate my temperature without ever going into the chilly or sweaty end of the spectrum. I enjoyed this very much. It was broadly the temperature range between 10 C (50 F) and maybe up to 20 C (70 F) - if in the shade - that I would wear just a jacket (hard or soft shell, though usually the former because I was testing one concurrently) over the Zip T without an intervening insulation layer. In higher temperatures, from about 15 C (60 F) - if in the sun - or 20 C (70 F) upwards, I was generally wearing *just* the Zip T as my only layer. 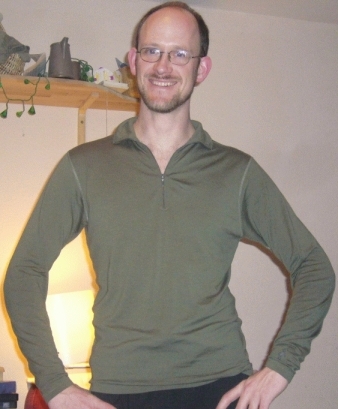 I generally felt that between both having the zipper down to the bottom of my sternum and the sleeves up over my elbows vs. having both the sleeves down and the zipper up to my chin, the Zip T spanned a rather broad temperature span for such a lightweight garment. For a recent dayhike with my kids and some friends, I wore short running tights and the Zip T, for a day in which the temperatures varied between about 15 and 20 C (60-70 F). It was a sunny day and though those whom we accompanied stated that they thought I was rather optimistic about the weather when we started, I was comfortable all day in the Zip T, whereas everybody else repeatedly changed layers. It was hard not to appear smug. More great things to report. I have yet to feel really sweaty in the Zip T. There have been a (very) few warm, sunny days already in which I would have resorted to a short sleeved T for jogging or mowing the lawn if I hadn't been testing the Zip T. And indeed wearing the Zip T made me feel a little warmer on those days than I would have preferred. Nevertheless, with the sleeves up and the zipper down, I never felt stiflingly hot or sweaty. At the other end of the temperature spectrum I was hiking up Kumotori-san in temperatures below freezing. In combination with a very breathable, well ventilated hardshell jacket and judicious use of that jacket's central and pit zippers, I was able to go through longish stretches of heavy exertion without becoming so sweaty that I would become chilled on the short rest breaks. I attribute this ability to the Zip T's excellent wicking properties (combined with the hard shell jacket's good ventilation). The only place where the Zip T did become soaked was in the contact spot of my backpack. This area, which received no ventilation at all during my ascent, was decidedly wet - proving that my feeling dry elsewhere was actually due to the wicking and ventilating effects of my garments rather than to lack of perspiration. The Zip T has remained comfortable throughout the Field Report phase. Whether freshly washed or less so, it has maintained a smooth, comfortable surface and huggy fit. It still stretches with my movements so that I've never felt restricted while I had it on. It's not the softest garment that I own, but it definitely doesn't scratch, itch or pinch anywhere either. As either of my daughters will attest, this is true both for me as I wear it as well as those I come into contact with. I appreciate that at least as much as they do. Another great thing about this top is its apparent inability to take on body odour. I have yet to wear it over several consecutive days of heavy, sweaty exertion but the two days (and intervening night) of such activity which it did see did not noticeably increase the gunk factor. I am hesitant to make a qualified statement regarding durability at this point. I've only had the Zip T for two months after all. Nevertheless it *has* seen a good bit of varied use in the meantime and does not appear to be fraying anywhere. The only criticism I could find in this regards is that the sleeve ends are no longer as springy and stretchy as they used to be. When I've worn them rolled up for a while, sliding them down again against the wind does not allow them to hug my wrists as they used to. So far, I believe this was usually taken care of through washing. I'll see whether that continues to do so or I must report a fading of its stretchy hugginess there. I'll continue wearing the Zip T a *lot*. This will include sports, backpacking and other pursuits. I've continued to use the ZipT whenever it wasn't in the laundry. Given that light stains hardly show up on its colour and it doesn't ever stink, it hasn't been in the laundry much and I've been wearing it correspondingly often. This was hiking, jogging, Jiu-Jitsuing, bicycling and mowing the lawn. I've mostly dayhiked in the recent past - my more notable outings were a group hike of nearby "�lberg", a family-oriented gathering I led towards the nearby L�wenburg (Lion Castle) ruins, and a three-day, two-night campout in the German-Luxembourg Nature Preserve, scouting out the terrain for our club's annual outdoor camp. It must have seen about a dozen active outdoor pursuit days that I would count as proper testing, plus being worn as casual everyday clothing. Temps ranged from about 15 to 28 C (60 to 80 F) - in the shade, I'm sure I've hiked in temperatures well over 30 C (in the 90s F). The ZipT hasn't been rained on. I've continued to wear the NTS ZipT into temperatures and humidities I would not ordinarily wear a long-sleeved shirt, in order to find the limit at which doing so becomes uncomfortable. I have yet to find that limit. The highest measured temperature was 28 C (82 F), though I'm sure it was much warmer in the sun (I never trust what my thermometer says when I leave it lying around in the sun for a while, the readings seem ludicrously high). Humidity was high enough to be felt, but not stifling. Definitely T-shirt weather. I've looked funny on more than one trip with short pants and long-sleeved top. Nevertheless, with the zipper all the way down and the sleeves rolled up, I never felt stifled in the NTS ZipT. My finding in this regard then, is that I can comfortably wear the SmartWool Lightweight NTS ZipT up into a temperature range in which I can comfortably walk without clothing on my upper body. As this negates the necessity for another layer, I am quite happy with that. I will still, now that the Long Term test phase of this shirt is over, resort to a short-sleeved T-shirt (a microweight one by the same manufacturer) in temperatures above 25 C (77 F) or thereabouts. But I've been so happy with its performance even in sun and heat that I'm considering purchasing a grey microweight version of this shirt, one size larger, for sun protection if and when I manage to embark on a long stretch of an exposed trail (the Southern end of the Pacific Crest Trail has been on my mind for a while). The shirt still looks and feels like new (now that it's been washed again). The few stains (natural dirt off the ground) have come out, and the sleeves still hug my wrists. I have some experience with even lighter weight merino wool garments and have to say that in my experience, the cloth of this shirt does appear to be considerably more abrasion and tear resistant than the lighter weight versions I've encountered. I don't like the realization because I seem to be turning into a bit of a gram weenie, but for a longer trek in variable weather conditions, I believe I'd choose this shirt over lighter options. The remainder of my experience does not differ from what I've stated before, so this report ends here. In short: I love it. I've found the temperature range in which I can comfortably wear this as an only layer larger than with any other garment I own. Below that range's lower end I still want to wear this as my primary base layer, and above the comfortable range I can still make do with this without becoming really uncomfortable. I have never felt uncomfortably sweaty in this, whether used as a baselayer or by itself, and this has included exertions which - for me at least - were quite considerable. I'd like to thank BackpackGearTest.org and SmwartWool for letting me participate in this test. It's been cool.